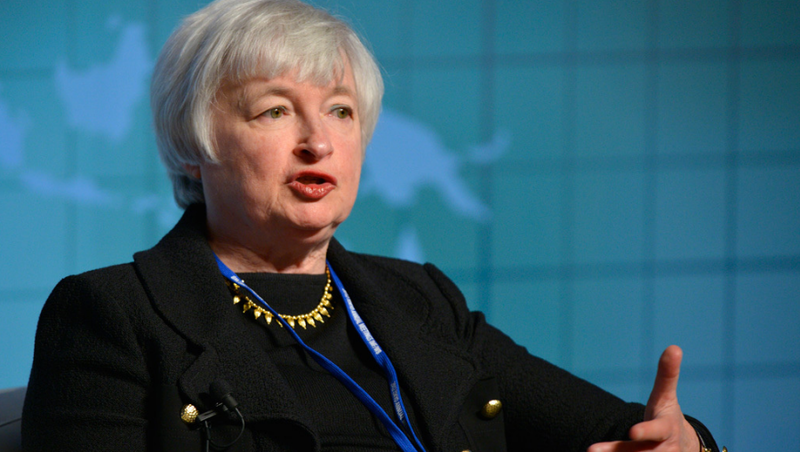 Federal Reserve Chairman Janet Yellen. Image by Day Donaldson. After drifting sideways since Monday, gold spiked back above the important $1,200 an ounce level on Wednesday after dovish talk from the US Federal Reserve following a widely expected hike in interest rates.Gold for delivery in April, the most active contract on the Comex market in New York with nearly 23m ounces traded, was trading just below $1,200 before the decision, but shot up $20 after Fed officials signalled only two more rate hikes this year, below what most economist had been predicting. Today’s rate hike was only the third adjustment higher in a decade. The metal also usually moves in the opposite direction of the US dollar and as the charts show the greenback also came in for punishment after the statement. Latest data also showed a jump in inflation in the world’s largest economy, with the rate of price growth nearly doubling in the twelve months to end January this year. Gold traditionally is viewed as a hedge against inflation. The last two times the FOMC raised rates gold reacted negatively in the run-up to the announcement only to rally afterwards. In December 2015, gold lost 2% during the month leading up to the hike, only to rally by 2.6% the following month. The before-and-after reaction to December 2016 was a drop of 5% (Trump’s election win playing its part) followed by a 3.4% rally. “While tighter monetary policy is not bullish, inflation and a range of uncertainties, including European elections and protectionism should support the yellow metal. As such, we see prices at $1,400 (per troy ounce) by year-end”.